When speaking with this incredibly intelligent, well spoken and talented young man, it’s very easy to forget that he’s only 16 years old. 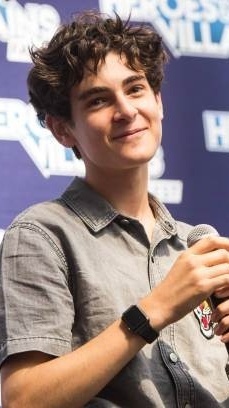 David Mazouz (pronounced Dahveed) has been acting for over eight years, and has already starred in two motion pictures and two seasons of Touch, alongside screen legend Kiefer Sutherland. 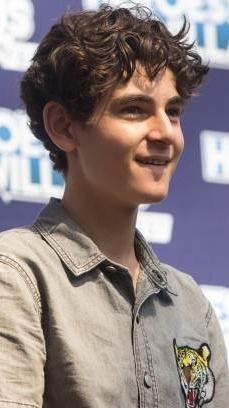 Of course, these days he’s known worldwide for portraying the teenage Bruce Wayne – the young man who will grow up to be Batman – in the excellent series Gotham. David is an incredible ambassador for the show. 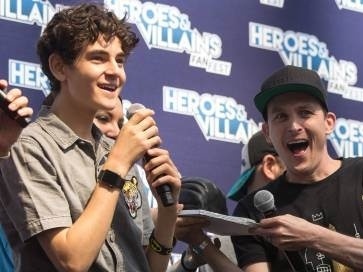 Dark Knight News caught up with the young star on his recent visit to London, for the recent Heroes & Villains FanFest. He had lots of interesting things to say. Dark Knight News: David, welcome to London! I hope we’ve been hospitable. 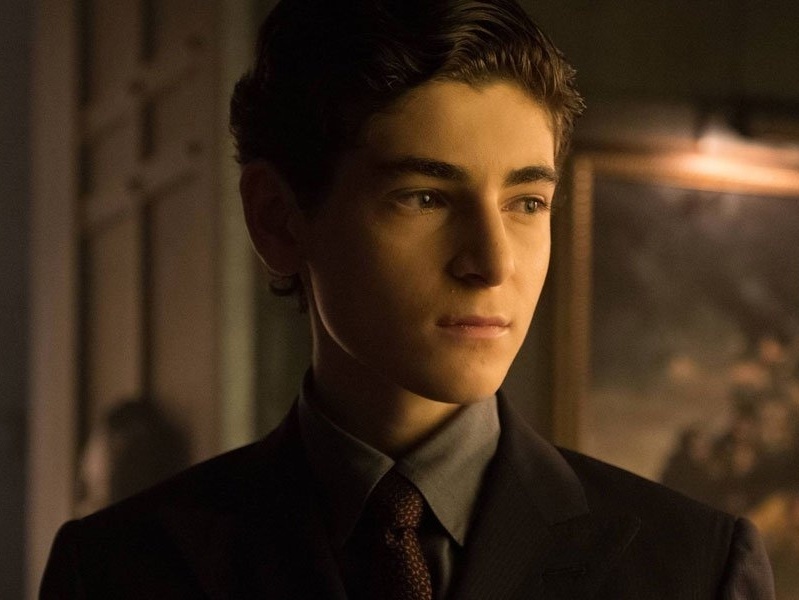 David Mazouz: Thank you. Yes, it’s incredible to be here. Sean (Pertwee) has been dying for us all to come here. DKN: So have the fans! DM: I can see! The number of people that came to the panel was awesome. So many great fans. DKN: I’ve actually been a fan of yours since way before Gotham. I rate your portrayal of Jake Bohm in Touch as simply phenomenal. For me it rivals Leonardo DiCaprio’s performance in What’s Eating Gilbert Grape. DM: That’s one of the greatest compliments I’ve ever received! DKN: I mean every word. He did it in one movie, perfectly, I must say… but you made an audience believe you were a mute, autistic genius for two whole seasons, and you started when you were just 11 years old! I was really upset when the show was cancelled, but elated when I heard you’d been cast as Bruce Wayne. DM: That’s incredibly kind. I did have Kiefer Sutherland, with me though. I learned so much on that show. DKN: I know you’ve read many of the comics, from previous interviews. You mentioned an interest in a possible meeting between Bruce Wayne and a young Clark Kent? DM: Yeah, that would be such a great idea. I mean, Gotham City’s shown like being just across the bay from Metropolis, so that could so happen. Also though, now with the Court Of Owls, maybe the rich families of the two cities could come together? 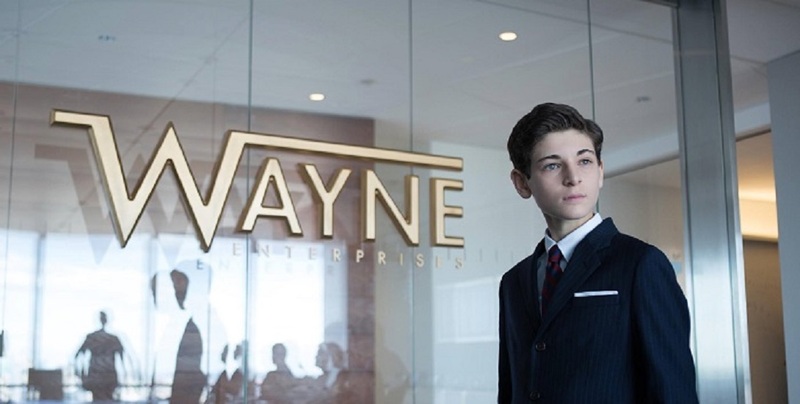 The wealthy families and business empires of Wayne Industries and Lexcorp? DKN: You mean meeting a young Lex Luthor? DM: That would be amazing. I don’t know if the ages are right. Are they… are Bruce, Clark and Lex Luthor all the same, or similar ages? DKN: That seems to change year by year, comic by comic, show by show and movie by movie. There have been times when they were, there have been times when Lex was only a few years older. There have also been times when Clark was in his 20s and Lex in his 40s. That’s always been up for interpretation. DM: Then, that could happen. That would be such a good story. DKN: I would love to see that meeting! Great answers. DKN: You must have been asked hundreds of questions, just here in London alone. Is there a question you wish you’d been asked, but never have? What’s a question you’d like to answer? At this point David stops, clearly thinking deeply about the question. DM: This is tough. That’s a good question. DM: I think… well. (Pause) I’m always asked about my roles, about who my inspirations are, and about my performances. Of course I’m fine with that, that’s what many fans want to know about. (Deeper pause) It’s difficult, because some people want to know personal stuff, which sometimes isn’t appropriate. I do sometimes wish, though, that… maybe someone would ask a question about me, not just me the actor. DKN: And how would you answer that question? DM: I’m a normal 16 year old guy. I like to do what normal 16 year olds do. It’s not just all about the acting. I totally love what I do, but I also like to relax, read, watch TV, see my friends… all the normal stuff. DKN: Every 16 year old should have that right. I imagine that most people don’t realise how hard that can be for you, doing what you do. DKN: So… to finish up. Hopefully Gotham will run for many, many more years. Do you want one day, as a man, to complete Bruce’s journey? 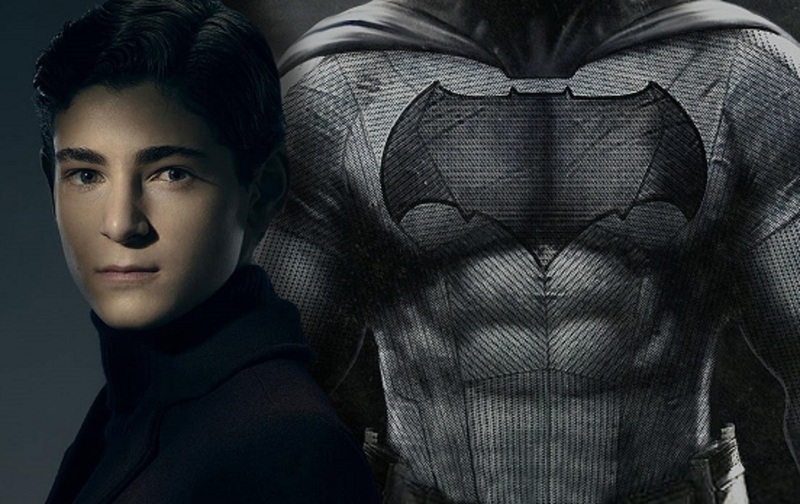 Would you like to end the final season by donning the cape and cowl, and becoming The Batman? DM: I would love that! That’s the dream. DKN: David. Thank you so much. My son and I attended day two of the FanFest, and we could not have wished for a better experience. 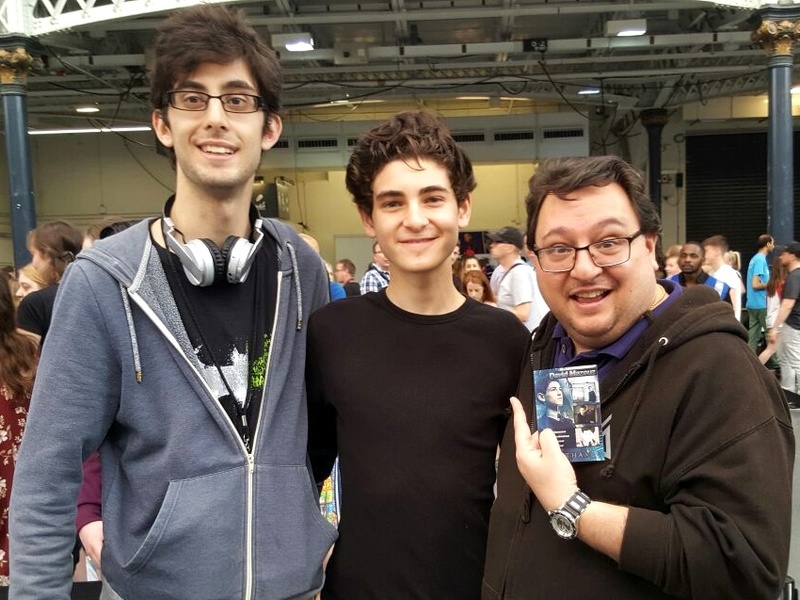 David Mazouz isn’t just an exceptional talent, he’s an exceptional young man. He gave us his time willingly and was as generous in his attitude to all the fans we saw him talk to as he was to us. I left the show a bigger fan than I was when I arrived.